The Kay Bergh Bulb House, situated in the south-western corner of the Conservatory, displays a wide selection of southern African indigenous bulbous plants and terrestrial orchids. The term bulbous is used for plants with subterranean storage organs, such as bulbs, corms, rhizomes and tubers. 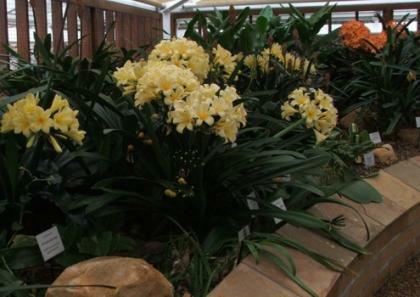 Visit the bulb house to view some of the world’s most beautiful flowers and experience the astonishing diversity of southern African bulbous plants. Bulbs from all over southern African are displayed here. The display area consists of both a permanent or planted display and a changing container display of mainly deciduous species as they come into flower. The planted display area provides a permanent backdrop of interesting foliage and features a selection of mainly evergreen bulbous plants The popular genus Clivia, indigenous to the eastern parts of South Africa, features strongly, and includes C. miniata, C. caulescens, C. nobilis and C. gardenii. Other evergreen bulbous plants displayed here include Bonatea speciosa, Crinum moorei, Haemanthus deformis, H. pauculifolius and H. albiflos, Scadoxus puniceus S. multiflorus, S. membranaceus, Boophone disticha, Drimiopsis maculata, Dietes butcheriana, Zantedeschia albomaculata, Cyrtanthus obliquus, Tulbaghia violacea and Mervilla plumbea (=Scilla natalensis). The container display provides a fascinating year-round window onto the world of southern African bulbous plants. The display reaches its peak in spring, from mid-August to the end of September, with a stunning selection of Cape bulbs in flower. The material for both displays is obtained from the Kirstenbosch bulbous plants living collection under the curatorship of our specialist bulb horticulturist Graham Duncan.